Be on notice.... There are several versions of this tent. After a couple of camping trips with the Big House 6, here's my review. Be aware. there are at least three versions of this tent (maybe four). 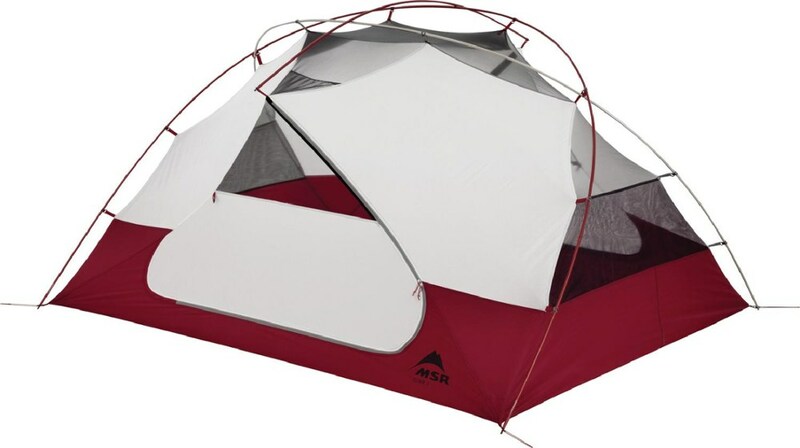 As described above, the newest version of this tent (2014) goes back to the two door, non-full coverage rain fly configuration. It also is a smaller tent in that it is now a rectangular footprint instead of the trapezoidal one. 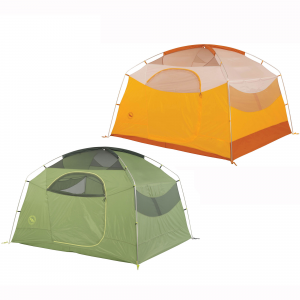 Both the pre-2013 and the 2013 version have a third full tent pole which goes from side to side, making the trapezoidal shape of the floor. As mentioned, we've had a couple of camping trips with this tent. The quality is very good, with fully taped seams on the floor, exposed door, and rain fly. Inside there are two nylon shelves for gear at the top back, two upper mesh gear pockets toward the front, as well as plenty of mesh storage around the bottom of the tent. There's plenty of head room. I'm a full 6' tall and don't come close to touching the top of the tent. The trapezoid design allow for a more vertical wall structure, thus more room. We sleep with two air beds, and use the "bump outs" of the trapezoid to put some of our gear. I'm a huge fan of full coverage rain flies. That's the reason I bought the 2013 version of this tent. Two doors are useful at times, but for our family of three, it's not a necessity. I'd much rather have the weather protection of the full fly. It also appears Big Agnes has done away with the high quality DAC aluminum poles and now uses something a bit cheaper. The poles they use now are no longer anodized, but just the plain aluminum color. They look and feel to be good quality, but only time will tell if they're as nice as the DAC poles. I think they'll probably hold up fine. 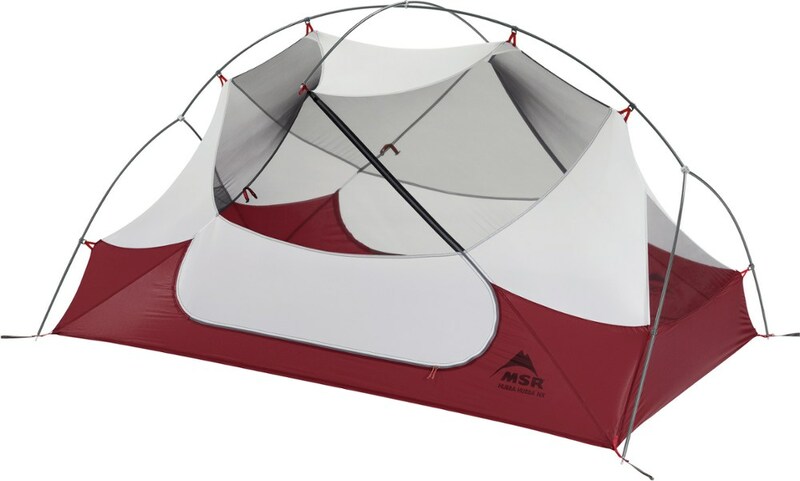 The tent and optional vestibule come with nice reflective guy lines, and pretty stout aluminum stakes. I like that the "guy outs" on the rain fly are also reflective. That said, I wish the guy lines were a more "florescent" color. They're dark maroon, which matches the tent, but in the shade and at dusk, they're a bit hard to notice if you're just walking around the tent without a light shining directly on them. I purchased 100 feet of florescent reflective yellow 550 paracord from Gorilla, and replaced the stock lines with this during down times on our two camping trips. HUGE difference in visibility. 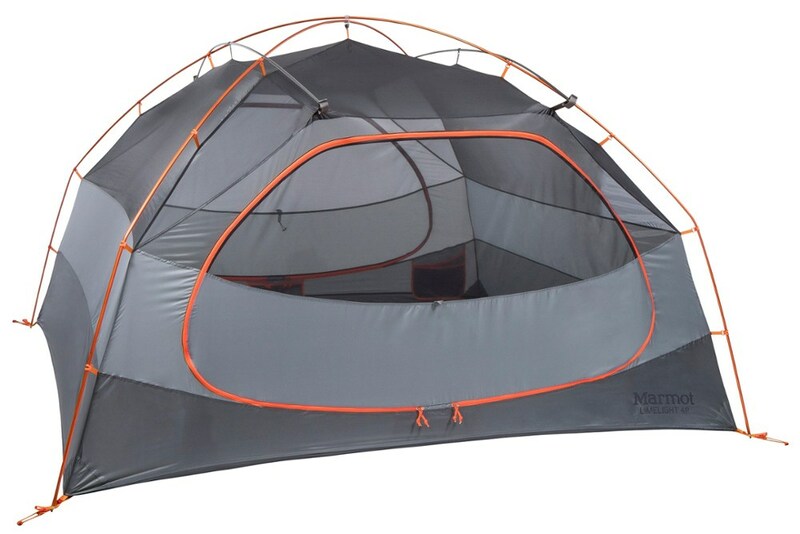 When researching to buy a tent, I also looked at the Marmot Halo 6 and Marmot Limestone 6. What sold me on the Big Agnes Big House is the ability to roll up the rain fly for extra ventilation with the rain fly still staked out. This feature really rocks. The ventilation with the fly rolled up is awesome. You can roll up the fly around the tent in about two minutes, and put it all the way back down in about one. During one of our trips we had some fairly heavy rain, but the full coverage fly kept us completely dry. The optional vestibule doesn't have a floor, but I just used some old canvas tarps to make a floor. It seemed much nicer this way, and made it easier to keep dirt out of the tent when coming and going. Easy to set up. Very stable/sturdy. Dry Dry Dry. Spacious. My wife and I love this tent. She was extremely hesitant about spending a lot on a tent but now admits it was worth every penny. This tent can be set up by 1 person. They have thought of everything to make it comfortable. Great rainfly so we were dry in a crazy rain storm. The next day when it was hot though, we were able to roll up the sides of the fly while it was still attached to cool off for a nap. Love the strong and light aluminum poles. We also got the vestibule and love it. It just keeps getting better. We were able to store a lot in it during rain and sit in it also to watch the rain. The only downside is that if it gets cold, this tent doesn't hold heat well. That being, because of the design, no moisture collects in the tent. Lastly I have to talk about the packaging. Our friends are jealous because the tent folds into an amazing easy to store bag. We even put 3 extra tarps and the vestibule in the bag along with extra large stakes and a hammer. Love the Big Agnes Big House 6 with vestibule. Best tent we ever had. Color is easy for the kids to spot in a crowded campground. Only con is the stakes, we have had to replace several but no big deal. We have had this tent for about five years now and still absolutely love it. It is easy to set up and easy to take down. We've been in several bad rainstorms and have not gotten wet. Plenty of room for two air mattresses and a dog. We also bought the vestibule and it gives you so much more room for coolers, muddy shoes, and we stow our chairs in the vestibule if the weather gets bad. Love that storage bag and they have the directions attached to the bag so if you don't use it for a while and forget how to set it up, you have it as a reference. This was one of our best camping purchases—well worth the money. Welcome to Trailspace, Sharon! Thanks for the review. Do you have any pictures of your Big Agnes tent you could show others in your review? This is a great car camping tent for small family or a couple who like a little extra room. It is very waterproof, roomy, and has some great features. It is fairly easy to set up and take down and comes with a great storage bag. I like that you can stand up in it (unless you are over 6 feet tall) and it is made with quality materials. The optional vestibule is a great addition. My wife and I bought this tent to replace our travel trailer so we wanted some space but not so much that it would fill our SUV when packed up. We were looking for a quality weather resistant tent that we could stand in, and we also wanted a large vestibule. This tent fit the bill. We own other Big Agnes products and have been very pleased with the quality of their equipment. This tent was reasonably priced. We paid $370. CDN. pus $116. for the optional vestibule. There are plenty of cheaper tents out there, but most of those don't have taped seams and would be questionable in a storm. We also wanted something that would last. The tent was easy to set up after the initial "get to know your tent session" The 3 main poles are identical in size and length so you can't mix them up. The fly goes on easily with colour coded corners. I like that the tent comes with a footprint. It also has several large gear storage pockets. 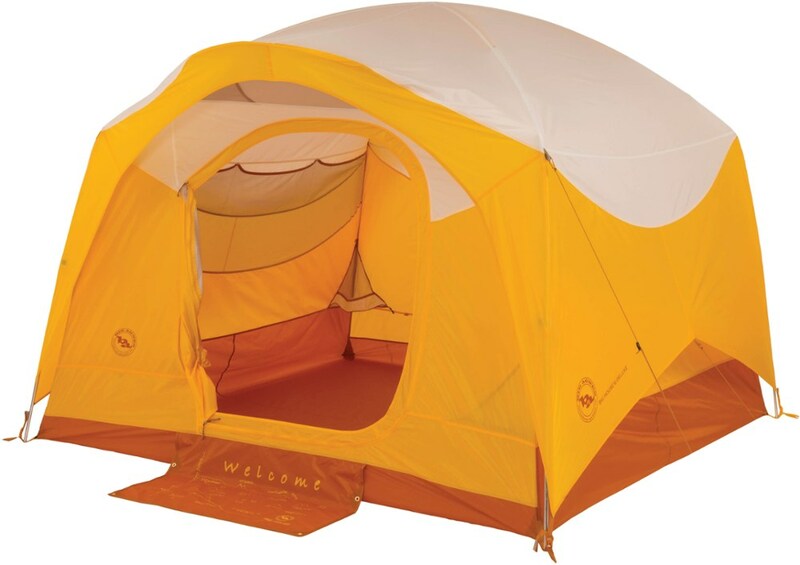 The 2 doors are large and the zippers work well as long as the corners of the tent are not staked out too tightly. The little welcome mat that says "welcome" in about a dozen languages is cute but superfluous. It is too small and flimsy to actually wipe your boots on. The tent comes with a very handy storage bag that easily holds the tent, fly, foot print, poles and pegs with out having to stuff, force or worry the various parts in. I'm sure we could fit the vestibule in as well, although we haven't tried. The fly design allows you to roll up both sides for more venting if it is guyed out properly, however they don't include enough tent stakes to do this, so we had to buy extra. We really love the optional vestibule. It is large enough for plenty of gear to be tucked out of sight and also worked well as the "sponge bath house". There is no floor in the vestibule, so we put a woven camping rug down and it worked perfectly. Be warned the vestibule is single wall and subject to condensation (especially after the bath). 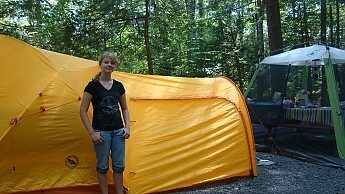 We have used this tent 4 times thus far and the last was a rain soaked week in Manning Park, BC. The tent held up well to all the inclement weather. We did have a few drops of water come through one of the corners. It was minimal and I'm not sure what caused it but I will keep an eye on it. Frankly considering the weather we had I'm surprised there wasn't more water in the tent. In summary we are very happy with our Big House 6. I would recommend it for car camping or a base camp set-up. Did not handle the wind well. The first time I used it there was a breeze (not a serious wind) most of the night and the short pole wrapping around the entrance wore a hole in the fly. Even staking the fly with all eight lines the tent blew down and bent the poles in a wind storm. It does not seem to be engineered for wind ... even a moderate one. Welcome to Trailspace, Norm. I'm sorry to hear your Big Agnes did not perform well. 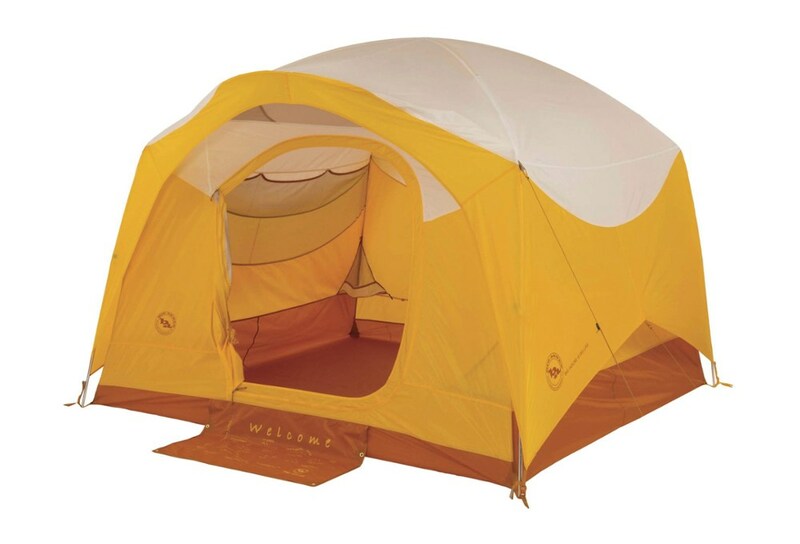 Do you have any pictures of the tent and the hole you could share in your review for others to see? Roomy, no leaks, solid in winds. Love this tent for the family! Source: Bought the BH-4, which is identical, but smaller. With exceptional service and highest quality materials Big Agnes has done a magnificant job for this family car camping tent, but it is time to for a redesign in 2013. Now, with close-outs you just can't beat the price you will pay for a Big House series tent. Uses materials found only in more expensive offerings. 3-pole design allows for lots of space, and strength. An innovative design allows the rain fly to be furled without removing the fly. Lots of tent pegs, but not strong enough. Pole diameters may be small for a tent that size. The Big Agnes Big House 6, like the BH-4, was made for the starting family and those looking for a great shelter for under $400, including the separate footprint. The BH-6 is for those who enjoy car camping, but lightweight enough to be split between two or three people for backpacking. Because it is presently on close-out sale it is an excellent bargain and can be gotten for a lot less. It is too early to speak of the Big House series for 2013, but they will have no back door on the new design, only a front entry. Obviously this will change the design of the tents quite a bit, but there will be more red color. This six person Big House legitimately has adequate space for 4-5 people, and that goes for most 6-person rated tents. It has features you expect to find in more expensive models, including color-coded coded webbing and buckles, locking pole ends and grommets, pole clips, sleeves, sealed seams and a bathtub floor to prevent leaks. The BH-6’s excellent pole structure provides sufficient head room up to 6 feet 3 inches, and creates lots of livable shelter for comfortable family car camping. The poles are lightweight DAC PressFit, TH72M 7001 aluminum (the latest technology in lightweight tent poles featuring improved durability) and of varying diameters to save weight. The sturdy three pole design does a great job in preventing collapse in strong wind gusts, as long as it's staked properly with provided reflective guy-lines. This freestanding dome tent has two large D-doorways and the mesh access panels can be sealed. One drawback is the lack of a fly vestibule, but the 90 sq. ft. permits room for gear inside the tent. From a pitching perspective this tent is a breeze. For first-timers setup might take 30 minutes to piece everything together. But later it could be done in as little as ten minutes for only one person. However, the BH-6’s rain-fly has back-side ties that need to be attached to poles, which might add a couple of minutes. Significantly you will find the tie-downs on inside of the fly - something you won’t discover on cheaper tents. These side release buckles attach the fly to poles for fast easy set up and keep them from separating during storms. They provide overall strength and wind resistance that plagues cheaper high profile dome tents without them. The best thing about the Big House tent is when the guy lines are out it allows the rain fly to be rolled part way, opening it up for air flow. You can furl the sides of the rain fly without removing the fly. When it rains it literally takes about a minute to unroll the surfaces and clip them down. While you might not want to sleep all the time, it’s a nice bonus configuration. The floor is made of durable polyester, and not nylon. It comes with 1500mm waterproof polyurethane coating. Polyester is similar to nylon, but resists abrasion, UV damage, and acid rain better; and, it does not shrink, stretch or sag. The fabrics of the body, doors and fly are all 75 denier ripstop — usually found in more expensive offerings. All seams are waterproofed with solvent-free polyurethane. The polyester mesh ceiling, wall panels and ground level side vents promote air circulation. Inside this tent are several mesh storage pockets that comfortably store most lightweight gear and electronics, keeping them off the floor or just organized. While it is freestanding it is a good practice to deploy the guy lines which gives added strength and stability when high winds or gusts occur. This Big House includes 14 superlight aluminum stakes. However, Big Agnes could put sturdier tent stakes in with this base camp tent, since the little hook ones bend easily. After all, it is not designed for back packing where weight is a factor. As a suggestion, it is good practice to invest in more rugged tent stakes. One’s that can be driven. And I personally would get rid of the little plastic tensioners that come with the guy-lines, using others such as: MSR Cam Rings, Nite Ize Figure 9s, or Taut-ties. The tent also features a welcome mat that provides a space for muddy shoes; but to be honest, Big Agnes could remove this feature as it is one of the hardest things to clean before packing up. Other purchases might cover optional equipment including a footprint, gear loft and an extra large zip-on front vestibule which is hooped for more room. These are sold separately. And if there is need for a smaller sized tent you can always move to the Big Agnes Big House 4. Also note, the outstanding customer service of Big Agnes is unexcelled. You won’t have lots of aggravation if you have a problem; it is something that will be taken care of. With Big Agnes you know they stand behind their products with a real life-time warranty, and not excuses. Now, all we have to do is to await the Big Agnes’ 2013 models of the Big House 6 to find out where they have made them better, if not for at a greater price than the current 2012 close-outs. Bought this to start family camping with my wife and two boys (2 and 6 years-old). I made the investment upfront, because I knew I'd have the tent for a good 10 years, or more. So we'd need the space. We fit a queen size Coleman air mattress and two Ridgerest pads with some room to spare for our bags. It vented very well. We had temps in the 60's at night and there was no condensation inside. It rained heavily the second night, and the factory taped seams held fine. We stayed dry all night. The optional vestibule is not an option in my mind. Buy it when you get the tent. We experienced passing showers and putting stuff under the vestibule rather then in the car was a great option. It's also nice to have a place in the shade to relax other than in the tent. The only negative is the fly has eight guy-lines, but only enough stakes for four. Rather than tie them into the stakes for the tent and ground cloth, I picked up a few extra at the local camping store - they were only a few bucks, but for the cost of the tent they could give them to you. One last thing to mention - tear-down a packing. The duffel that they give you is a great bonus. Unlike most items you buy, the tent and accessories fit into the provided storage bag with few problems. I've put up and taken down this tent three times, and don't have to refold things to get them to fit the storage bag. A huge bonus in my mind - especially for a tent this size. Overall, I'm very impressed and pleased with this tent. It's definitely worth the investment - I searched around online and picked up the tent, ground cloth, and vestibule for the retail price of the tent. This is a great tent. Me and my family have used it three times and it has been a good choice. Big Agnes has done a good job sealing all the seams because not a drop of water got inside. Good venting. Easy set up. Good in the wind if you stake it down correctly. I would suggest getting the added vestibule because it is a good place to keep your coolers and other supplies in the shade. the vestibule is not as big as the pic but still good size. Sleeps 5 comfortably. Really a good family tent. The Big Agnes Big House 6 is not available from the stores we monitor. It was last seen May 1, 2018	at EMS.